Essays & PapersWhy We Moved to the Himalayas To Build Our Startup? On 5th September, a week after launching our app YourQuote on Google Play, we packed our bags, books and guitars, and drove 500 kilometers from Delhi to Solang Valley, six kilometers farther off from Manali. We found ourselves at a stranded guest-house with high speed WiFi and a well-furnished kitchen with a cook at an inexpensive price, that’s all that mattered. 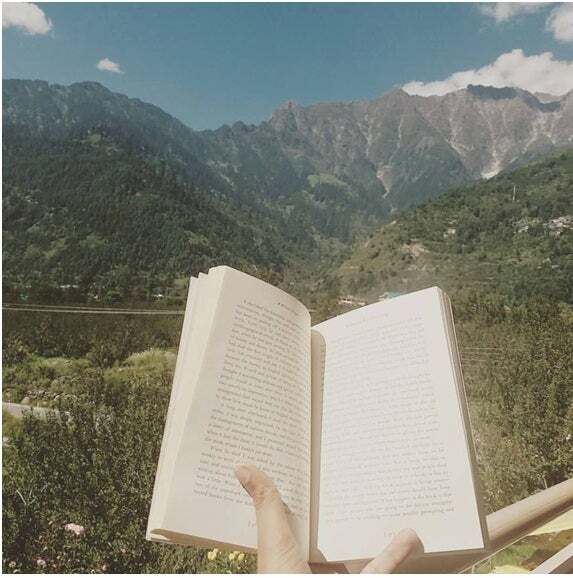 One day later, we began our work in our balcony office that faces the Himalayas. People back in Delhi thought we had gone mad, that the internet speed would be dismal in the hills and electricity would be sporadic. Sadly for them, none of their skepticism came true. I had been to this place three years ago while traveling across India and everything is just fine as it was back then. We don’t plan to return anytime soon, not until it starts to snow here, which is December. When asked why we chose to move, we had countless answers. No, it wasn’t for seeking inspiration (we are already quite inspired), not even for the premium maal that Manali is famous for (sadly, we aren’t too fond of it) nor it was to hire talents (we are self-sufficient as a team of two). Since we are building a viral tech-product that requires no operations, we were location independent. The primary reason became saving cost, thus moving to a small town became a natural need — what could have been a better alternative than an underpopulated Himalayan village? But more than any of these reasons, the impetus for moving was the pure disillusionment with the startup folks in Delhi.
. There are very few product folks in Delhi, most being sales/business development driven. YourQuote is our fourth product in the past one year and being the novice entrepreneurs that we were, we met a lot of folks in the industry for the past one year. Angel investors, VCs, fellow entrepreneurs, wannapreneurs and self-proclaimed start-up mentors with no courage to start their own venture. Sadly, barring a couple of insightful folks running their own product companies, everyone’s advice sounded like the quintessential start-up gyaan with little substance. “Do this, you will get funding,” “go out and network with other entrepreneurs, you will get this”, “this person will help you get connected to that person, meet him/her”, and the redundant “I think it has a lot of potential but add a hyperlocal/video element to this”. I remember Ashish and I driving all the way to Chandigarh, burning 5000 rupees in a day, to meet the founder of a renowned company. The meeting went well, or so I thought, and in the end this fellow entrepreneur made it clear that he wasn’t willing to invest but he would be happy to connect me to some stalwarts in the Indian start-up scene—Anupam Mittal, Kunal Shah and their likes. He splattered out their names himself. He asked us to revamp our deck and mail it to him — so that he could connect. We did as asked, kept following up with him for 2 months, but to no effect. Nothing came out of it except our disappointment and the feeling of being fooled. I detest start-up folks who don’t value the time of their fellow entrepreneurs. Why can’t they be blunt and straightforward? A simple no is far better than a hazy yes. Product requires vision and a key insight into the industry that comes from working in the industry for years. The gyaanbaazi that Delhi folks offer centres around the business model than the product, around marketing rather than growth. So many people wasted so much of our time that I am now averse to the industry — most of all, these analysts who call themselves VCs and pick brains with their second-hand start-up knowledge, never having built anything of their own. The first question I ask any prospective employee is the same as that I ask a prospective investor: “Have you used the product?” Until you use my product, all your ideas are vacuous and you are basically planning to invest your time and energy and even money on an idea that you want to build—not what we are building. Building a social product in India is challenging, and our abandonment of the previous three products is a testimony to that, because there is a dearth of early adopters in India. When our previous product failed to pick a viral trajectory on its own after some time, I resorted to an idea that I had already tested and attained product-market fit during my college days. A mobile-first microblogging platform for claiming copyright on one’s quotes, so that a simple Google search could lead one to those quotes. As a writer, it was a problem I deeply related to. There was no existing way to stop the rampant plagiarism going on in the social media. Attribution of credit to your short creativity was amiss. Therefore, for YourQuote, instead of going the usual text-only way, we devised a pictorial way of doing it—so that the pictures are shareable, visually stunning and non-copyable. Mobile-first approach implied doing away with the entire trouble of setting up a blog and so on. Inspired from Instagram, we created an app where the user logs in and starts posting their quotes on beautiful wallpapers right away, with no resistance. Hence, a writer garners his/her own follower base with their wit and creativity besides plagiarism becomes difficult as you cannot highlight the text on a jpeg and cropping the user’s name away will make the wallpaper look bad. Over the past two weeks, we have cracked UGC (user generated content — often considered a beast by the Indian investors) and have had over 2000 quotes posted on our platform by a little more than 500 users. We have decided we are not going to meet any Indian entrepreneurial folks for advice or investment. Because we don’t need any more of their recycled gyaan. The only feedback we care about is our users’, who are already helping us build our platform better and more robust. Nobody in India has ever built a global social product from scratch. Nobody in India understands what the writers want better than us. Nobody knows how to run a start-up so lean that even a year and a half later, you have both the funds and inspiration to thrive for another year. We will keep working out of the Himalayas, invite inspired folks to come and help us grow our niche network until we escape from one Valley to another. Amen. "Startup Culture has Started Taking Roots in Kolkata"